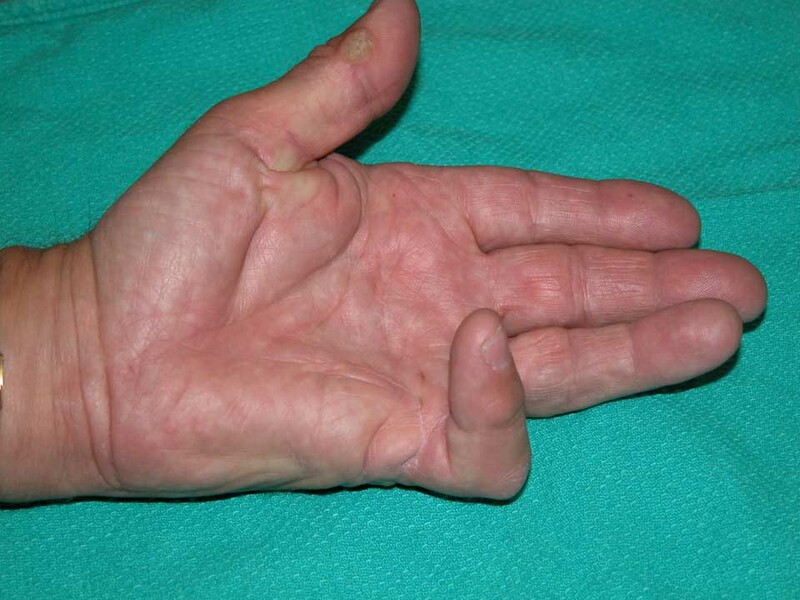 Dupuytren’s contracture is a hand deformity that usually develops slowly, over years. Dupuytren’s contracture affects a layer of tissue that lies under the skin of your palm known as the palmar fascia. This is a gristle like layer that is present in everyone’s hands. It connects with the skin, bones and tendons. Knots of tissue form within this layer under the skin. As these knots gradually grow bigger they can thicken and form into cords that can pull one or more of your fingers into a bent position. 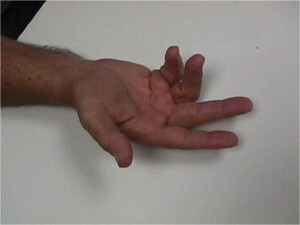 Dupuytren’s contracture most commonly affects the ring finger and little finger but can occur in any finger. A number of treatments are available to slow the progression of Dupuytren’s contracture and relieve symptoms. 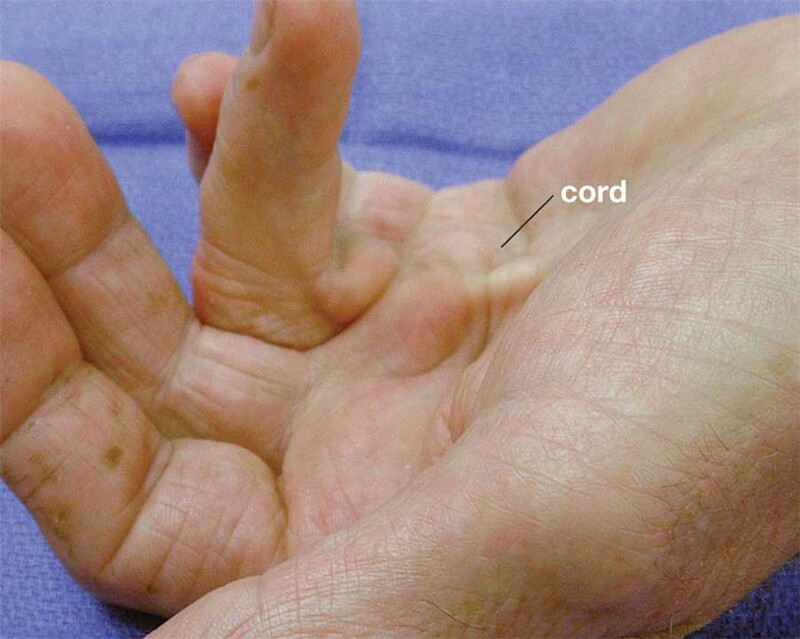 Dupuytren’s contracture is a progressive disease, meaning that it gradually gets worse with time. Typically it progresses slowly over many years. Occasionally it can develop over weeks or months. In some people it progresses steadily, and in others it may start and stop. 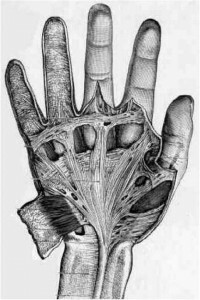 Dupuytren’s contracture usually begins as a thickening of the skin on the palm of your hand. 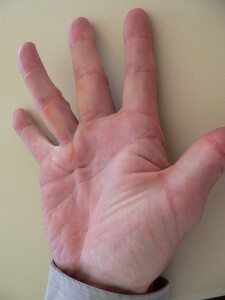 As Dupuytren’s contracture progresses, the skin on the palm of your hand may appear puckered or dimpled. A firm lump of tissue may form on your palm. This lump may be sensitive to the touch and is occasionally painful. In later stages of Dupuytren’s contracture, cords of tissue form under the skin on your palm and may extend up to your fingers. As these cords tighten, your fingers may be pulled toward your palm, sometimes severely, preventing them from straightening. The ring finger and little finger are most commonly affected, though the middle finger also may be involved. Only rarely are the thumb and index finger affected. Dupuytren’s contracture can occur in both hands, though one hand is usually affected more severely than the other. Dupuytren’s contracture occurs most commonly after the age of 50. People of Northern European descent are at higher risk of the disease. People with diabetes are reported to have an increased risk of Dupuytren’s contracture. In most cases investigations are not necessary. Dupuytren’s disease can be diagnosed simply by looking at and feeling your hands. Other tests are rarely necessary. If the disease progresses slowly, causes no pain and has little impact on your ability to use your hands for everyday tasks, you may not need treatment. Instead, you may choose to wait and see if your Dupuytren’s contracture progresses. Treatment involves removing or breaking apart the cords that are pulling your fingers in toward your palm. This can be done in several different ways. The choice of procedure depends on the severity of your particular symptoms and any other health problems you may have. The diseased cords of tissue in Dupuytren’s contracture connect with the skin as well as with the deeper structures. Because of this it is not possible to completely remove all of the affected tissue and therefore all treatments for Dupuytren’s carry a risk of recurrence of the disease and your doctor will discuss this with you regarding the treatment most suitable for you. The following are procedures available to treat Dupuytren’s contracture. Injecting a type of enzyme into the taut cord in your palm can soften and weaken it — allowing your doctor to later manipulate your hand and break the cord straightening your fingers. 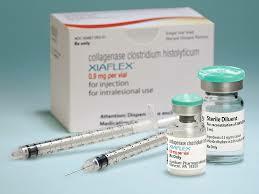 The advantages and disadvantages of the enzyme injection are similar to needling, though colagenase injections may be suitable for a wider range of Dupuytren’s . Another option is to surgically remove the tissue in your palm and fingers affected by the disease. The main advantage to surgery is that it results in a more complete joint release than that provided by the needle or enzyme methods and can address the tight skin in severe cases. The main disadvantages are that physical therapy is usually needed after surgery, and the recovery time can be longer. In some severe cases, your surgeon will have to remove all the tissue affected by Dupuytren’s contracture, including the attached skin. In these cases a skin graft will be needed to replace this skin. This surgery is the most invasive option and has the longest recovery time. People usually require several months of hand therapy afterward. Your surgeon will discuss with you the options available that are most appropriate for your particular condition.